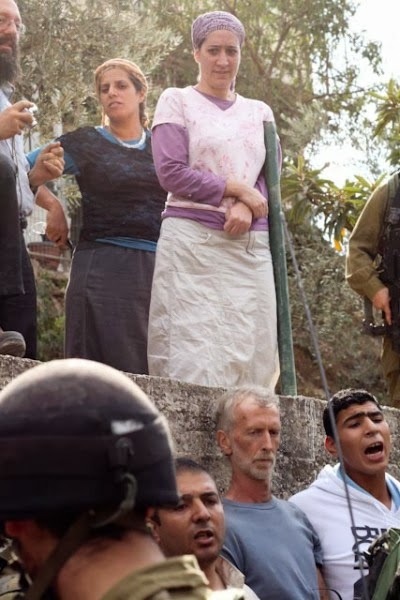 Words can’t describe how the Christian Palestinians of Tel Rumeida (whose disperson our fundamentalists here support who are attacked by the neo-Nazi settlers of Kiryat Arba (where the supporters of Meir Kahane are extremely strong) are arrested by Israeli soldiers, not their attackers. Our puppet of Foreign Minister, Haig, of course says nothing. Though each area of Palestine can be said to be unique, Tel Rumeida is truly a world unto itself. Located in the Israeli-controlled area of Hebron, Tel Rumeida is a small neighborhood living out the brutal extravagance of direct Israeli occupation. If Tel Rumeida is viewed as a microcosm of the Israeli plan for Palestine, the sometimes subtle realities of Palestinian life under occupation and the type of Palestinian state Israel desires can be more easily comprehended. Nearly every tactic used by Israel to create its merciless occupation is employed in Tel Rumeida: displacement, imprisonment, economic strangulation, extreme militarization, arbitrary detention, land confiscation, disruption of normal Palestinian life, settler violence, soldier brutality, government complicity with illegal settler acts, and daily humiliation. 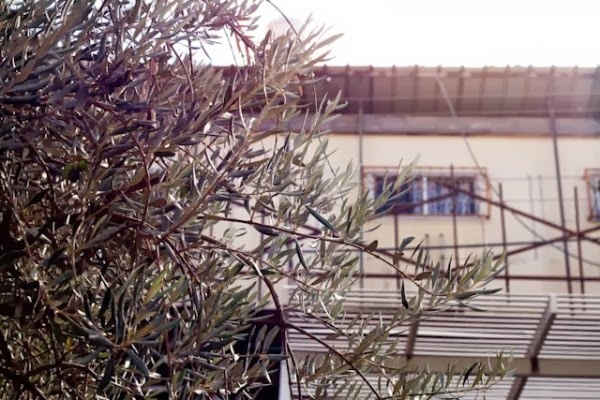 The Palestinian residents of Tel Rumeida never experience the living of a normal day. The nearly three years of curfew they endured during this intifada permanently scar the lives of every resident and the community itself. The five soldier stations and recently modernized electronic checkpoint currently located on three streets make it nearly impossible for residents to walk anywhere unhindered. The two settlements, Beit Haddasseh and the Tel Rumeida settlement, housing some of the West Bank’s most extreme settlers (including members of Kach, designated by Israel as a terrorist organization,) and located at the top and bottom of the Tel Rumeida neighborhood, ensure that Palestinians living here will, at the very least, have a daily reminder that they are no longer welcome in their own neighborhood. The endless abandoned homes and forcibly-closed stores, many of them sprayed with violently racist settler graffiti, do their own part in contributing to the solemnly eerie atmosphere of the neighborhood. The living conditions in Tel Rumeida are that of apartheid. Palestinians are not allowed to drive their vehicles on the streets; they are for Israelis only. Palestinian residents must carry or cart everything to their homes while settlers take joyrides through the neighborhood. Palestinians are forced to take winding, dangerous, secondary paths to reach their houses while Israeli settlers use the primary paths. 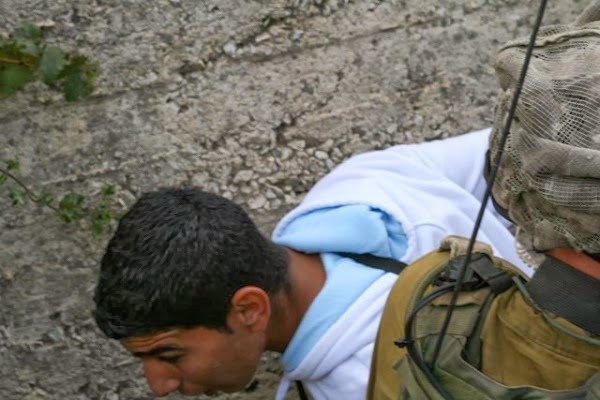 Though the Palestinian residents do not participate in the violence which is so unceasingly apparent in the neighborhood, it is they who are stopped by the Israeli soldiers and forced to lift their shirts and open their purses. Though it is mainly the settler children, immune by law from prosecution, who terrorize Palestinian children and adults and who attack soldiers, it is the Palestinian children who are constantly stopped, who have their schoolbags searched, who are yelled at and hit by soldiers. It is Palestinians who must wait in lines to enter the electronic checkpoint every time they enter or leave their community. It is Palestinians who are harassed and humiliated by nearly every conceivable variety of Israeli law enforcement official as are in existence. 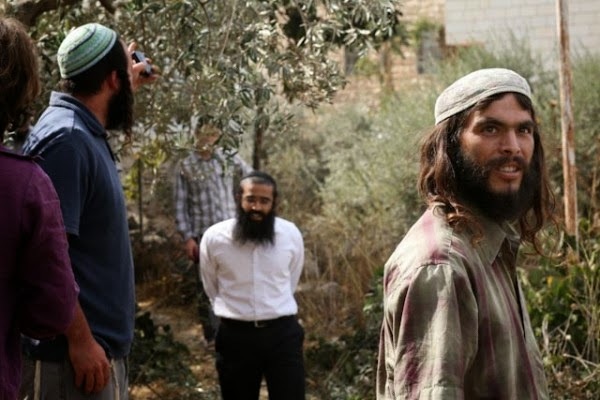 Israeli settlers rule Tel Rumeida. Young settler boys saunter through the Tel Rumeida streets stoning or attacking homes and Palestinian residents at will under the indifferent eyes of Israeli soldiers and police. Damaged and destroyed Palestinian homes, gardens, water pipes, phone lines, and windows live as a testament to the wrath of the settlers’ former deeds. The absolute impunity with which these settlers operate, combined with their overt camaraderie with the Israeli soldiers and policemen, are nothing less than a palpable message to the Palestinian residents of the neighborhood that their safety is not an Israeli concern. Nearly every Palestinian resident of Tel Rumeida has a disturbingly devastating story, such as that of a young pregnant mother who has had two miscarriages in as many years as a direct result of Israeli violence. Last year, she was two months pregnant and, after Israeli soldiers came inside her home and fired their weapons, was found lying on the floor of her home, bleeding, and later lost her child. This year, only a month ago, pregnant with twins and home alone, her house was attacked by seven armed settlers screaming death threats. Soldiers stationed less than 30 meters from her home did not respond to her calls for help during the 20 minute attack. Two hours later, lying again on the floor of her home, she lost her first twin. Later in a hospital operation, she lost the second. Since the death of her twins, she has suffered from nervous attacks and has been repeatedly hospitalized for collapsing. The children of Tel Rumeida, though they are many, almost never play outside. Those who do venture out run off the streets at the first sound of an approaching settler vehicle and run into their homes when groups of settlers walk by. 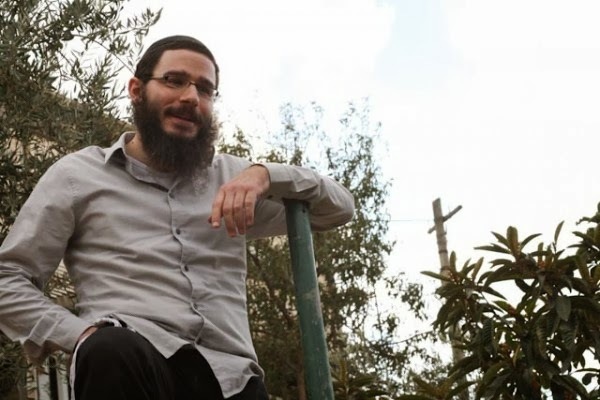 Even the youngest child of Tel Rumeida has learned indelible lessons about the type of people their Israeli settler neighbors are and their own place in the neighborhood, acting out these lessons on a daily basis. Tel Rumeida is one of the few areas in Palestine living under direct Israeli occupation. 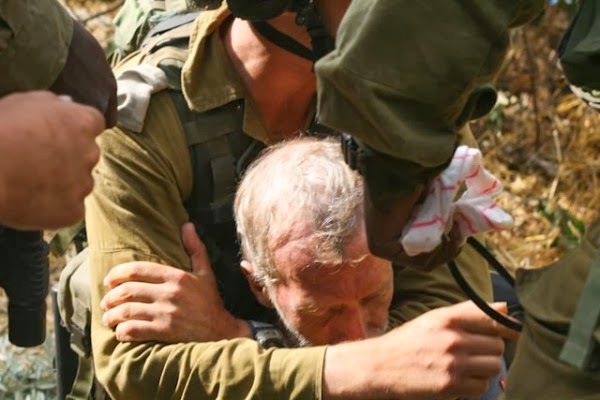 The outcome of this occupation is a brutalized Palestinian community, economically devastated and imprisoned, living under the endless violence of their Israeli neighbors. Tel Rumeida is the Israeli occupation writ large. UPDATE: 10.30pm – All 3 men have now been released without charge. Today, a group of settlers from the illegal settlement in Tel Rumeida arrived at Hashem Azzeh’s olive grove next to his house at around 12.30pm, whilst he and his family were harvesting their olives, yelling for everyone to get off of “their” land. Hashem and his family were on their land harvesting olives for the first time in 5 years after being granted permission from the District Civil Liaison. He was accompanied by several members of his family as well as activists from the International Solidarity Movement. The situation quickly escalated as settlers pushed the Palestinians in order to try and enter Hashem’s house. At this point around ten more settlers had come down and joined in, shouting abuse at Hashem and his family. The soldiers pushed the Palestinians and internationals back towards Hashem’s house threatening to arrest anyone who did not obey. 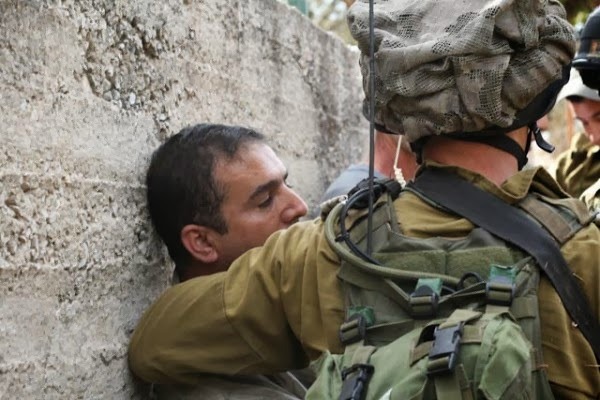 The soldiers grabbed a young Palestinian man by the name of Imad Al Atrash who was video taping standing behind international activists: pushed him against the wall and zip-tied his arms behind his back. 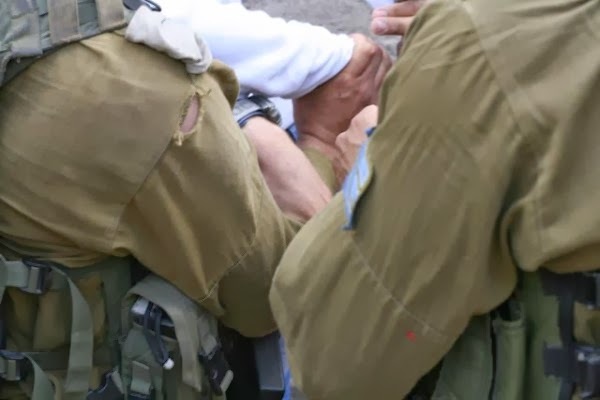 The two Palestinians and Italian activist have been arrested and taken to a police station in the illegal settlement of Kiryat Arba. The district of Tel Rumeida is heavily militarized and contains the homes of both Israeli settlers and Palestinians. Hasham’s family moved to Tel Rumeida in 1950 after being forcibly removed from their homes in what is now Israel. The Tel Rumeida settlement was installed in 1984. In an attack in 2006 the settlers smashed Hasham’s nephews’ teeth in with a stone. That same year his wife (3 months pregnant at the time) was attacked and subsequently miscarried. Again in 2006 she was attacked, this time 4 months pregnant, and again, suffered from a miscarriage due to the attack. 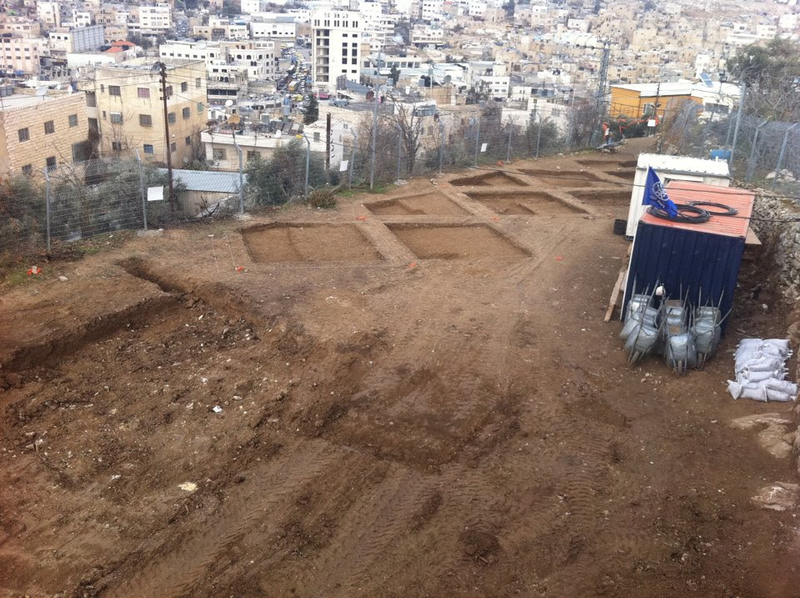 On 5 January 2014, CPTers learned that a bulldozer had begun leveling a large tract of a Palestinian orchard for the expansion of the Tel Rumeida settlement complex on the previous evening. Two CPTers visited with Hani Abu Haikel, long-time CPT partner, on 7 January to learn more details. According to Abu Haikel, his family has held a 99-year lease, of which twenty-five years are left, on the orchard that was demolished to create the outpost. The Abu Haikels had originally leased the land from the Bajaio family, Palestinian Jews whose family the Abu Haikels sheltered during the Hebron Massacre in 1929. Then they leased the land from the Jordanian government, which occupied the area after 1949, and the Israeli government after 1967. The Israeli government has blocked the lease Abu Haikel’s family holds on this area in order to allow the settlers to continue construction on this new, outpost. Police arrested Abu Haikel and his cousin on 5 January for being in a ‘closed military zone’ when they asked by what right the settlers were destroying their mature almond trees. They then banned the two men from going within 250 meters of the site.